The Moselle River 1944 Association has announced the commemoration events of the 75th anniversary of the liberation of the Department of the Moselle in France. The events will be held in November of 2019 and will be organized around the weekend of November 16-17. A welcome cocktail evening will occur on the evening of Thursday November 14 and attendees will be able to make their departure home on Wednesday November 20. This will allow about one week for everyone to attend the various ceremonies and local visits that are planned in the Thionville area. The city and town governments of Thionville, Terville, Malling and the council of the Moselle have already expressed their full-hearted support of the 75th anniversary commemoration. Numerous military vehicle clubs and their re-enactors have committed to participate in the ceremonies. 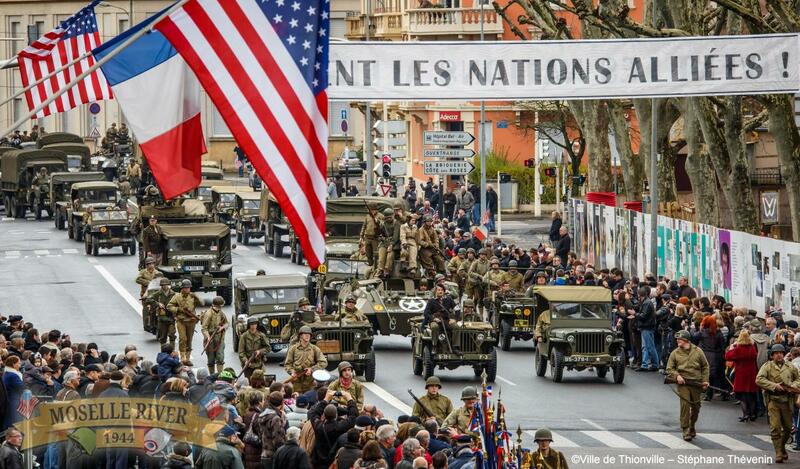 The grand parade that will take place in Thionville is planned to be as grand and as impressive as the parade that was held in 2014 at the 70th anniversary celebration. If you have any interest in attending the 75th anniversary commemoration in November of 2019, please send an email to MR1944@10tharmored.com with your name and the number of people in your party that may like to attend. We will be sure to keep you updated on events as more details are known and as the November date draws closer. We hope to see many of you in the Moselle in November of 2019! Please see photos of the 2014 celebration below.